Kutia Kondha is one of the primitive sections of Kondha tribe. 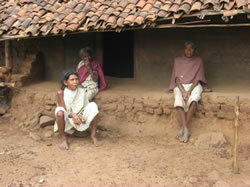 The Kondha’s who live in hill top and valleys are known as Kutia Kondha. Whereas those who live in high land and near the streams are called Dongria Kondha and kondhas who are residing in plain area are known as Desia kondh..
Kutia kondh are mostly dependent on shifting cultivation, cultivation of minor agriculture products and collection of NTFP. The Kutia kondhs are residing mostly in Langigarh,Th.rampur,M.Rampur and Bhawanipatna block of Kalahandi. The Kutia Kondh settlement is having two rows of houses, across a rectangular space facing each other. All the Kutia kondh houses of a village maintain single roof, although each house having partition wall, and the varandha run from one end to other. The economic life of Kutia kondh is dependent on forest. They practice shifting cultivation, cultivating varities of crop and during lean period collecting food stuffs from the forest. Minor forest products also fetch them cash income. The social organization is very strong and unified. The family is mostly nuclear and patriarchal in character. Social unity and co-opration is remarkable. Women play a bigger role in the family economy. They are mostly nature worshipper. Jani is the fulltime magico religious specialist of the village. In the pre-independence era they were practicing human sacrifice but now a day as substitute buffalo and sheep sacrifice. The practice of youth dormitory are though gradually losing its importance but still prevalent among Kutia kondh villages. Dhap, Salap baja are the important musical instruments of Kutia Kondhs. The kutia kondhs are in transition in the recent decade with the intervention of Government. There is gradual development and transformation in the field of social life, education, infrastructural development etc.